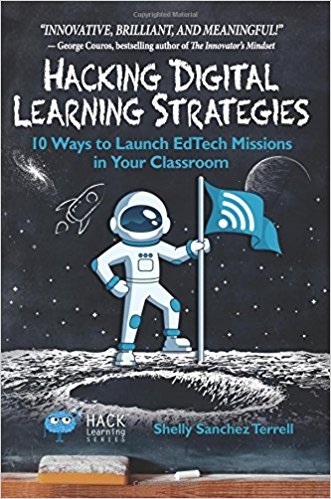 Hacking Digital Learning Strategies: 10 Ways to Launch EdTech Missions in Your Classroom by Shelly Sanchez Terrell offers specific lesson plans for integrating technology and engaging students in real-world activities. This book has everything you need including cautions that can help you avoid unexpected problems. Every school should grab a copy to pass around. Then get one for each teacher. Technology has empowered our students, who now have the potential to learn anything in exciting ways. Students like to connect and share and now they can. They can also do scary things such as bullying and posting inappropriate images. While they navigate the digital world it’s time to guide them to make more meaningful choices. This book outlines ten missions to inspire students to reflect on their responsibilities as citizens navigating the digital and physical worlds. We should tie school lessons and activities to meaningful purposes that go beyond making good grades or passing tests. Mission 1. Design a Game Walkthrough: Create a tutorial and teach others how to play. Shelly starts with a story of how she decided to let her ESL students teach the world’s religions to each other. She knew they knew more than she did. It was totally hands-on as the students dressed in customary attire, played music, and showed artifacts. They practiced dances, learned songs, and participated in rituals. Everyone learned so much, including Shelly! She learned that learning is more powerful when students take the reins. Unfortunately, traditional teaching doesn’t work this way. and writing skills with digital media. Students learn how to write simple, clear, and concise instructions. Like all of the missions in this book, Shelly provides plenty of detail so teachers should be ready to go. Teachers should have some exemplars to show students, involve students in giving and receiving feedback, and the idea that they can always make their work better. She recommends posting student work online and like all missions provides potential obstacles such as complaints from parents and administrators. Mission 2. Go on a Selfie Adventure: Define yourself through images. important moments, experiences, struggles, and successes. To complete this mission, students must take selfies that meet different challenges. Each challenge shows students how to capture better selfies that more effectively tell the stories of their lives. Each selfie also guides young content creators to build a strong digital identity. Provide at least five criteria for this selfie mission. Possible challenges include taking a selfie with a pet, a favorite book, a favorite teacher, a hobby, or a favorite food. Instruct students to take selfies at different times of the day, in different environments, and engaged in different learning experiences. They will then create a digital story that they can share with the class. Ideally, the mission will motivate kids to reflect on what makes them unique and to experience life as individuals no matter how their peers perceive them. Depending on the class, teaching photography concepts may be necessary. Mission 3. Create a Fictional Social Media Profile: Manage your digital footprint more purposefully. Many schools filter and ban social media to avoid having students encounter the dark side of the internet on their watch. This means our learners are navigating the vast digital world with no guidance or support. For this mission, students create a social media profile for an historical figure and manage the posts, shares, and exchanges for at least five days. Their choices will either enhance or sully the credibility and reputation of their historical figures. After this experiment, students determine if their shares, posts, reactions, and behavior hindered their historical figures’ contributions to the world. practices to protect their digital footprints and manage their digital reputations. This requires that they know the history surrounding their person as they apply it to the social media footprint. It also requires critical thinking as they evaluate their effort. Be sure that administrators and parents know what is going as some schools and parents don’t want kids on social media let along using it as a learning tool. This entry was posted on Saturday, November 4th, 2017 at 6:07 am	and is filed under Book Summaries, Education Books. You can follow any responses to this entry through the RSS 2.0 feed. You can leave a response, or trackback from your own site.